Extra track and a tacky badge. That thought was fleeting, but it was also unfair. Because I should trust Darwyn Cooke. He’s earned it. I can’t find the interview with the exact quote at the moment, but he said that if they were going to charge a trailer-load of cash for a repackaging, he was going to make it worthwhile. Well, he did. If there’s one problem with Parker–The Martini Edition, it’s that it’s so gorgeous you may be afraid to touch it. But you need to. Books are for reading, after all. So what do you get for your hard-earned dinero? You get that sweet slipcase pictured above. You get The Hunter and The Outfit, looking big and beautiful at 9″ x 13″. You get a short adaptation of the conclusion of The Seventh. It stands on its own pretty well, but it made me hope that it’s someday expanded to a full-length book. You get Tom Spurgeon’s excellent interview with Darwyn and special guest Ed Brubaker from The Comics Reporter. Yeah, it’s available online, but it’s nice to have a dead tree version. You get a small portfolio, inspired by The Hunter, entitled “The Man Called Parker.” This stuff is just great. 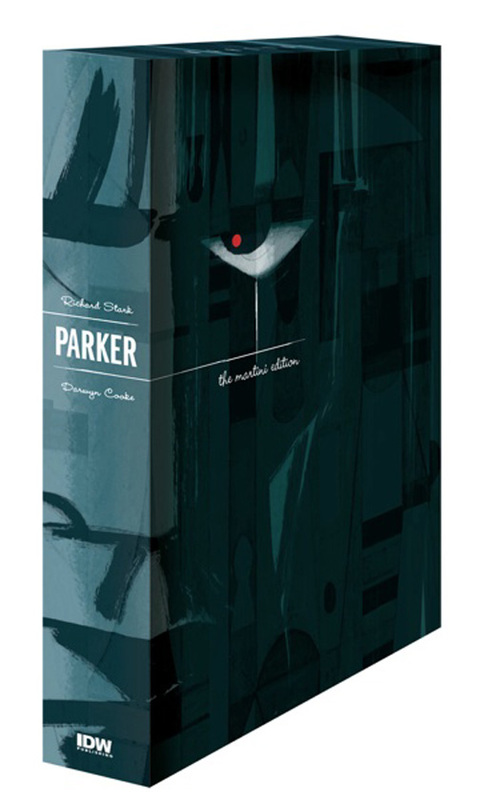 You get a portfolio of drawings inspired by the films based on Parker, with a few well-chosen asides. This is also great. I was pleased to see The Limey getting some well-deserved recognition. And the drawing of Peter Coyote is the only good thing to come out of the godawful mess that was the Slayground film. And there are other goodies sprinkled along the way. All told, it’s 65 pages of new material according to the press release. This is the ultimate fan letter to Donald Westlake. I wish he could see it. If you have those already? I know times are tight, but I don’t think you’ll regret the purchase for a minute once you get your greedy little hands on it, and you can always take the opportunity (as another site suggested) to give those editions to someone you love for Christmas and create another fan. It sounds great, and I’ve had a few opportunities to purchase it as a reasonable discounted price. Problem is — everyone describes it differently and shows different pics. I’m not certain how many special editions are out there. Is this the definitive special edition … and is it the ONLY special edition? The one pictured above is the one IDW sent me and the one that will be in stores. There are a couple of alternate slipcases out there–special limited ones for comic conventions and so on–but the contents of the book itself should be the same no matter the slipcase to the best of my knowledge. I can’t tell you if it will be the only special edition, because there will probably be others down the line because that’s the way the world of comics (and the world of movies and the world of music) works. But it is the only special edition for now, and any future special editions probably won’t come out for years. One thing I didn’t think about until now that I’m disappointed isn’t in it is the promo Parker sketchbook or sketchbooks that comic shops were giving away at one point. I don’t know much about this or those because I don’t have them. If you’ve got any questions about what is or isn’t in it, feel free to ask me in the comments here or via e-mail, and I’ll be happy to let you know. I’d never heard of this until this moment. I’m SO distressed now…I want this something fierce.